Ray Ferrier's (Tom Cruise) Tripod Captive Costume from Steven Spielberg's 2005 adaptation of H.G. Well's sci-fi horror short, War of the Worlds. In the film, a troubled father, Ray, must protect his children as he escorts them to Boston, amidst a devastating and relentless alien invasion. This costume, which consists of a leather jacket, t-shirt, and jeans, can be seen worn by Ray throughout the film. However, the sleeves on this costume�s jacket are two inches larger in circumference than others made for the film, indicating that this jacket was used when Ray is pulled from an alien tripod�s clutches by other captives. 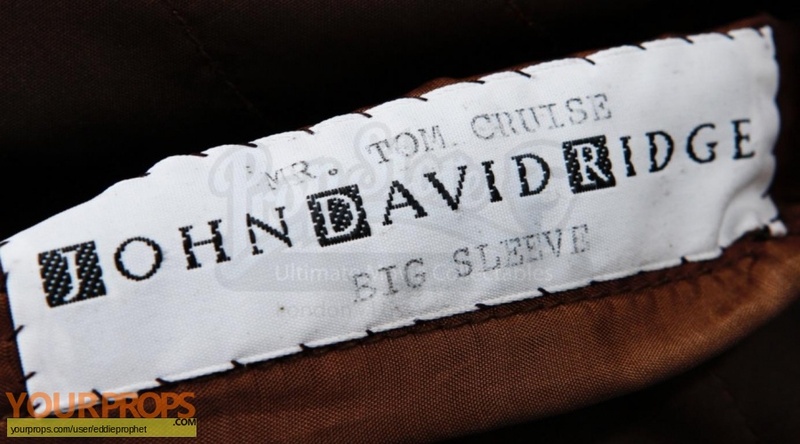 As Cruise was physically held and pulled in that scene by multiple actors, he wore this larger jacket to accommodate padding under the sleeves. The jacket is made by John David Ridge and features a brown leather exterior with white and red stripes on the arms. 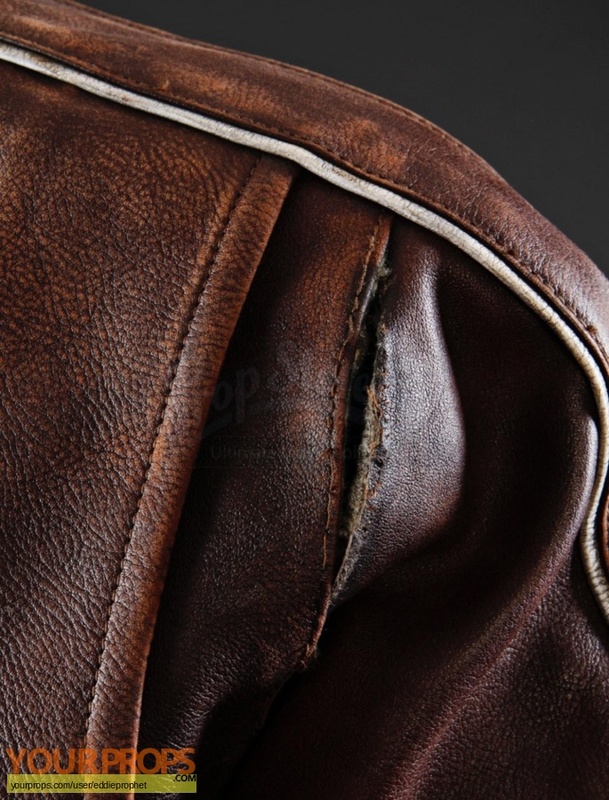 The jacket includes three exterior pockets, one on the upper left breast, and two pockets on either hip. Inside the left interior pocket is a production tag that reads "Mr. Tom Cruise - Large Sleeve." This jacket features a production made tear on the right shoulder blade that can be seen in the film after Ray is and his family are grabbed from their car. Also included is a blue/grey t-shirt that has been distressed by production to appear dirty and soiled. Although the tag has been removed from the collar, "Ray 132-159" has been written on the collar in black ink. Below the waist are Ray's jeans, made by Paper Denim & Cloth from 100% cotton. These dark blue jeans have a small tear just below the right knee and have been textured by production to appear dirtied. Written on the manufacturer tag located at the back of the waist is "132-159" indicating that these pants were worn in the film�s final act. The costume is accompanied by a corresponding production tag that notes the scenes the costume was used for, as well explain the reasons for the larger sleeves; �From inside pod�. While the jacket and the t-shirt do not include any sizing tags, the jeans are marked as a size 32. This costume features notable production distressing and has been dirtied to appear soiled, however it remains in overall excellent worn condition. view all 60 items of "eddieprophet"
** The content of this listing is the sole responsibility of eddieprophet. Yourprops.com, its owners, agents and assigns assume no liability.